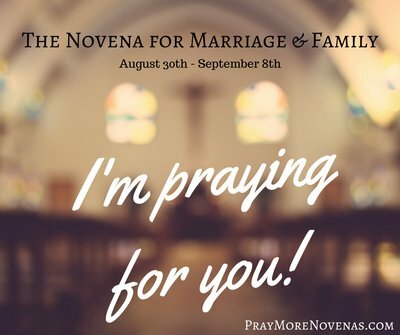 Here’s Day 1 of the Novena for Marriage & Family! Please pray for my friend, George, and his wife and daughter. He is considering ending his relationship with his wife after 20 years of marriage. Please pray the marriage may be reconciled for their sake and the sake of their daughter. Please pray for marriage to be restored. My husband has left my daughter and me. He is involved with another woman and his family is supporting the relationship. He is filled with negativity towards me and says he will never return. Please pray for a miracle. Thank you all and I pray for all of you. Please pray for us as we are now 10 years married but have no children. We want this blessing through Mother Mary and her son Jesus. Please pray for my daughter Michelle & her fiancee Dominic for their upcoming wedding civil ceremony on September 3 & their upcoming church wedding on September 9 that God will bless their marriage with Love, Hope Faith through the intercession of the Blessed Virgin Mary in Jesus name, Amen. Thank you for praying with me & for Michelle and Dominic. I am praying for peace in my home. Restore love and good relationship between my husband and myself. My husband is being influenced by outside forces and wants to kick me out. He’s had an adulterous relationship and it has messed up his mind. Pray for us. Please help me pray for the restoration of our marriage. I pray for a change for myself and for my husband to see the light and end the adulterous relationship with another woman. I pray for strength, faith and hope. I put all my trust in You Father Almighty. I praying for Mother Mary to intercede on my family. Please pray for me and my wife and kids. We are going through a terrible time and need prayers to make it through this. Thank you all so much. Please pray for me and my children my husband has committed adultery and has abandoned us. The pain is way too much. Please pray for me I am in a confused and dishonest relationship my heart doesn’t know what to believe and where to focus.Pray that we may be able to forgive and understand each other with the father of my two daughters and eventually settle properly for our good and the good of our children. Please pray for my husband who is not well. I am afraid for my 19 year marriage. Wonderful news! May you both continue to strengthen your bond. PLEASE PRAY FOR ME I WANT TO CONCEIVE THIS YEAR. I WANT A HEALTHY AND BEAUTIFUL BABY .. Pleas pray for all young families and for my daughter marriage and family : Johanna Kristina and Toni Markus, thank You very much! Lets pray for all marriages ! And ecpecially for youth who destroy themself in open relationships , escpecially for my 17 years daughter Triinu Helena ! Thank You ! Father in Heaven, through the intercession of the Blessed Virgin Mary, I pray that my husband and I will continue to be understanding of each other, sincere, honest and faithful to each other. I pray for our family to always have peace and deeper faith in You. And most of all I pray for physical healing for my Dad, that he will be healed of his cancer and become healthy again. All these I pray, in Jesus’ name. Amen. Please pray that my son ‘s marriage will be fixed . That my son will stop drinking due to stress with his wife. That they will treat one another with love and respect. That they will be as loving and sweet as before and be one again as couple. Please pray for my daughter going through a confused, troubled time. May she get the counseling needed to give her peace. Pray for my son in law that he may have forgiveness and understanding. That their love and marriage be healed and their children not be severed by divorce. I am praying for a job closer to home that will provide for the needs for my family, but reduce the amount of time I spend on my commute. I love my family and want to have time to spend with them. For my husband’s conversion so that we can be strong together in following the faith and leading our children to heaven. With the help of all the saints in Heaven and all our family members who have gone before us. Pray for Peace & Mercy with my 3 sons, Pray that they trust in You and become holier. Pray that my 2 college sons are keeping faith and trust in You. Pray that they are safe with Your loving arms around them as You walk this journey with them! I also pray with my whole heart and soul that my son Sean returns home to me, I pray that he returns to the church and prays more, in seeking Your help Lord Jesus. He has left my home saying all I do is argue with him on all counts. He is disrespectful with his words and actions, I pray he honors Your commandments of both Mother and Father. I pray that you give me the words and guidance that he will listen with an open heart and mind. I pray with all my heart that You hear my prayers and help me help him. He’ll be a senior in High School and I want to cherish this last year with him around. Help him find his way. Thank-you for all that I am blessed with my Home, Jobs, and Health! I pray for all the families in Texas that they find Hope, Peace and Love in all things through this terrible tragedy. I can feel your pain dear. I join my faith with yours, believing God who is the owner of all hearts will answer our prayers. Amen. Cheers. You are blessed sis! I lift my children up in prayer and pray for deep conversion in their lives. I pray that Daniel will meet a special Catholic girl and that Phillip and Kathryn will be blessed with children very soon, if it be your holy will, Lord. Thank you JESUS & mother Mary. I love you. Good Health in body, mind and spirit for Sarah, Wayne, Bonita and Julie. I pray for a stronger, happier and holier marriage. Please cure my husband and help him get rid of all his bad habits (alcoholism, lies, dishonesty etc.) completely. May our faith in this marriage be restored. May we cultivate love and friendship again in this relationship. Please help my Husband, please make him a pure and divine person. Please help him get rid of all the bad ppl and defects. Mother Mary please intercede on my behalf to Your ever loving Son, my Savior, Jesus Christ and our Lord, our Heavenly Father to please bless me with abundance, discernment of His Will; and, the sacrament of holy marriage to a loving, compassionate, honorable man Our Heavenly Father has personally chosen for me. I trust in my Lord God to charge St. Raphael with leading me to my chosen husband as he led and blessed Tobias to Sara. I shall honor my Lord, my Savior, and the Holy Spirit all the days of my life. I pray that we will have a blessed marriage. That our children feel loved, and that we are good parents. Lords be with Us we need you helps us . Please pray that I will find a good Catholic man to marry. If I have already found him, pray to bless our relationship and for discernment. For the conversion of my family and close friends. For my daughter’s marriage. For my son’s courtship. For wisdom concerning a friend. Most pure and inviolate Mary, I pray that you may hide and shelter me within your shroud so that I may feel the loving embrace of a mother at my hour of great suffering. Help me to regain dignity and chastity as it has been ripped away, and allow the healing grace of your Son to encourage my heart to not be hardened or embittered by wrongs done to me. I pray also, that you would take a special interest in moving the heart of the one that committed these acts out of selfishness and prompting from the serpent, for through Divine Love the serpent’s head shall be crushed once more. Mary, full of grace…pray for us. I pray that my daughters, husband and myself self stay united with each other. I pray that through the recitation of this novena with faith, trust, hope and confidence, our Mother Mary will interfere for me to our Lord and bless my family with a baby boy, a son to the glory of husband amen.. I pray that through the recitation of this novena with faith, trust, hope and confidence, our Mother Mary will interced for me to our Lord and bless my family with a baby boy, a son to the glory of His name amen.. I pray for the restoration of my marriage. I pray for my husband’s heart of stone to be replaced with one of flesh -full of tenderness and love. I pray that his desires to separate and to be with other women end and that he turns to Christ and accept Jesus as his Lord and Savior. I pray that our children not feel the pain of separation or divorce and that we can restore our marriage before it comes to this. Holy Mother, I pray for the woman who is in his life who is influencing him negatively – I pray for revelation and understanding and for her to leave my husband and return to her own. Holy Mother, please intercede on our behalf for the restoration of our marriage and our family and the renewal of faith, hope, and love between my husband and I and within our household. I pray For my marriage to grow stronger and for my Wife and daughter to repair their relationship. I pray for this divorce battle to be resolved sooner than later, most specifically the financial strain on myself, since I am the physical and emotional caretaker of the children. Guide me, Lord, so I can continue to do your will as the Christian that I am. Please help me with coping with old husband’s disposition. Make my family more aware that l need help and that l am able to cope better. In the name of the father.